CROWN HEIGHTS — Those looking for a summer breeze to go along with an afternoon drink don't have to travel far. From Covenhoven on Classon Avenue to the newly opened Branch Ofc. 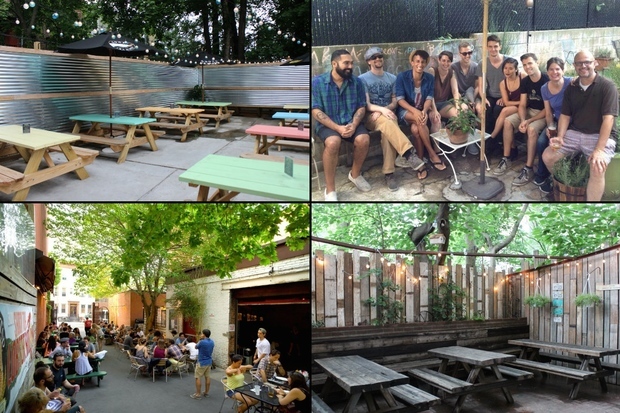 on Rogers Avenue, there are plenty of local spots to drink alfresco this season. But if you’re looking for a great sidewalk cafe, look to other Brooklyn neighborhoods — unless you want to wait for Chavela’s to open theirs. This relative newcomer to the Crown Heights bar scene has a lot to offer those wilting in summer heat. It offers a boozy snow cone drink, called the “Sloe Cone" and a large, airy backyard with beach-umbrella-covered tables. There's two pinball machines inside the air-conditioned bar, too. If you love Cajun food and don’t mind close quarters, the backyard at Catfish might be your spot. Three picnic tables under strings of oversized Christmas lights and a thick canopy of trees makes for a cozy setting to enjoy the bar’s New Orleans-inspired cocktails, daily brunch menu or $1 oyster happy hour. To get that grass-between-the-toes feel, check out Covenhoven’s backyard, complete with a sprinkling of chairs on top of an honest-to-goodness lawn. It also offers an extensive tap list — regularly featuring more than a dozen beers between $6 and $8 — and The Simpsons-themed trivia night, held most Tuesday nights. This L-shaped beer garden is less a bar than a drinking campus with its attached burger joint, Dutch Boy Burger. The eatery leads to two interior bars that open out to a tree-covered courtyard through huge garage doors. With all that space, Franklin Park has a lot of options for a good time, including its popular monthly reading series and weekly trivia nights. If you’re looking for open air on a late night on Nostrand Avenue, this is your place. The Nostrand Avenue Pub is open until 4 a.m. every day and has a big back patio with enough space at their many picnic tables. And, bonus, the place is known to give out free pretzels at the bar, so tip well and you might get lucky. For those who don't have a backyard, Morgan's decked out patio might be a good alternative. It offers a barbecue menu, serves cocktails out of mason jars, and includes a rocking chair with a view of of Flatbush and St. Marks avenues. Oh, and it's dog-friendly too. Venture to the west side of Washington Avenue for the very large, casual backyard at Washington Commons and choose from a selection of domestic and imported brews on tap. And love it or hate it, be aware: the backyard is one of the last places in the neighborhood where smokers are welcome.